Oh, my goodness this is ace. 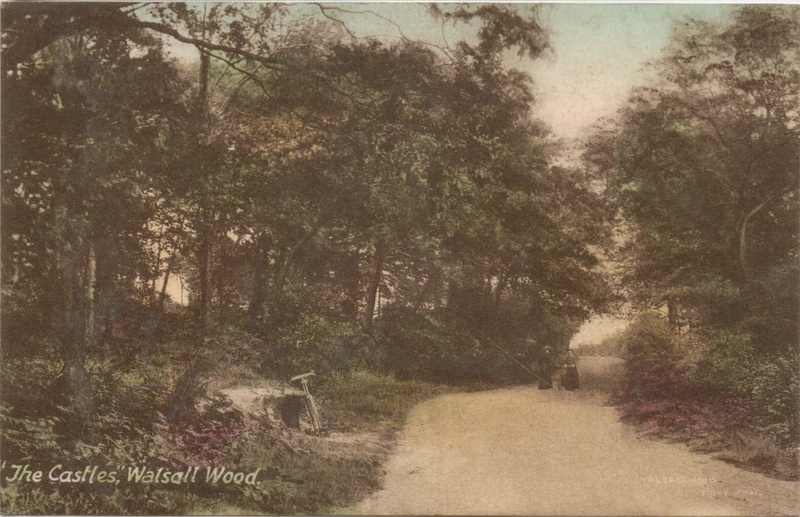 Pelsall Road, looking towards Brownhills, Swan Pub on the left. How bucolic it all looks.Image courtesy of Ruth Penrhyn-Lowe. Watling Street looking towards the Rising Sun – Rehoboth just visible in the distance. Image courtesy of Ruth Penrhyn-Lowe. Blimey – after all the parish notices, adverts and local affairs of previous weeks, it’s good to get back to some local history at last – and what better way to do so than with a remarkable collection of postcards sent to me, completely unsolicited by the wonderful Ruth Penrhyn-Lowe? I love to feature old postcards here – they’re so ephemeral and evocative of the times they originate from. Several will be familiar – others not so. What is remarkable is the scan quality – marvel as familiar images are more detailed than ever before. I’m so grateful to be able to share these pictures with readers. Thanks to Ruth for the time and effort taken. I hope you don’t mind me contacting you but your site seems like just the place! My lovely Dad passed away in January, a Leighswood man by birth, he was passionate about local history and I have reams of hand written personal memoires from his childhood in Leighswood and Aldridge together with a few old photos. 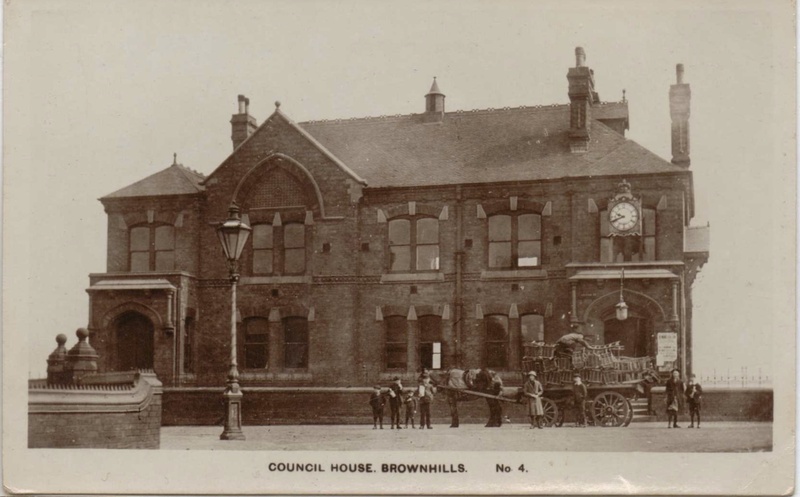 I also have some other old postcards which he collected over may years, including Hammerwich, Lichfield, Rugeley, Cannock, Chasetown, Hednesford, Walsall and Stafford and these few of Brownhills which I thought might be interesting to share on your site, if any of them are new to you! The photos are of Leighswood, mainly the back of Leighswood Row, a couple of my Dad and some mates swimming in the ‘cut’ and the open ground around the canal and snaps with the old brick works and pit in the background. I also have a couple of photos of my granddad as a boy one has a date of 1923 – 4 and is of the Tigers football team, the other is at Aldridge School of 1921. I also have one of those long all-school photos of Walsall Grammar School 1948 which my dad is in and he has included a note identifying some of the others in the photo – this is really fragile and frayed now and very difficult to flatten out. I also have some maps of Aldridge and immediate area dated 1914, 1961, 1938, 1968 and 1919 – these are way to big for my sorry little scanner but I could try get them copied or photographed if you would be interested in seeing them! My dad has written things of family interest on them. They are all folded. I am kind of overwhelmed with all this – to me – treasure, and I am trying to organise it as he sent it to me over several years and, although I loved getting his packages of memories, it’s only now that he’s gone that the full importance is hitting me. Anyway I wondered if these postcards were of any use for you to share. 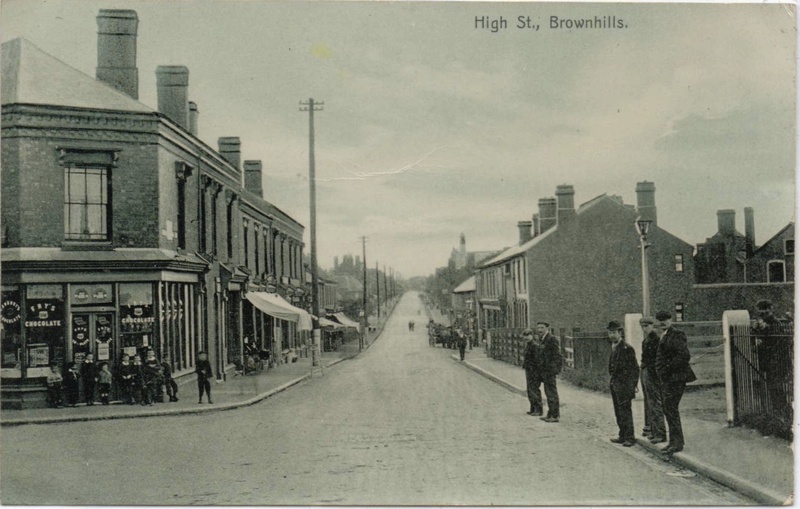 The High Street Brownhills card with the group of children in front of the shop is addressed to Miss A M Durrant, Nether Beacon, Lichfield, post mark (19)07; Brownhills, Church Road is addressed to Miss Gibbs, 30 Ripley Road, Swindon Wilts possible postmark (19)15; Pelsall Road Brownhills is addressed to M B Loeke, Lower Slaughter Gloucestershire, postmark (19)07. The other three are not postally used. If you would like to see any others I am happy to have a go at scanning them for you – although me and the scanner nearly came to blows this morning! Ruth – my condolences for the loss of your father, but thanks for having the generosity of spirit to share such lovely stuff with the readers of the blog. It’s a pleasure to do so, and I’d love scans of anything you have. I’ll drop you a line later today and see what we can sort out. I am truly bowled over by your thoughtfulness. Cheers, these are remarkable images and very well scanned! Comment here or BrownhillsBob at Googlemail dot com. Cheers! Durrant? Nether Beacon? One for Lichfield Lore I think. Image courtesy of Ruth Penrhyn-Lowe. Hand tinted, an image seen before, but never in this quality. Love the bike. Image courtesy of Ruth Penrhyn-Lowe. Iconic image of the Council House – but what’s on the cart? Image courtesy of Ruth Penrhyn-Lowe. Gibbs? Help required, please… Image courtesy of Ruth Penrhyn-Lowe. Brewes corner – that’s their bakery on the corner. Nice hats. Again, a cracking quality image. Love the scallies outside the shop. Station Hotel on the right, of course. Image courtesy of Ruth Penrhyn-Lowe. Lower Slaughter – wonderful placename. Image courtesy of Ruth Penrhyn-Lowe. 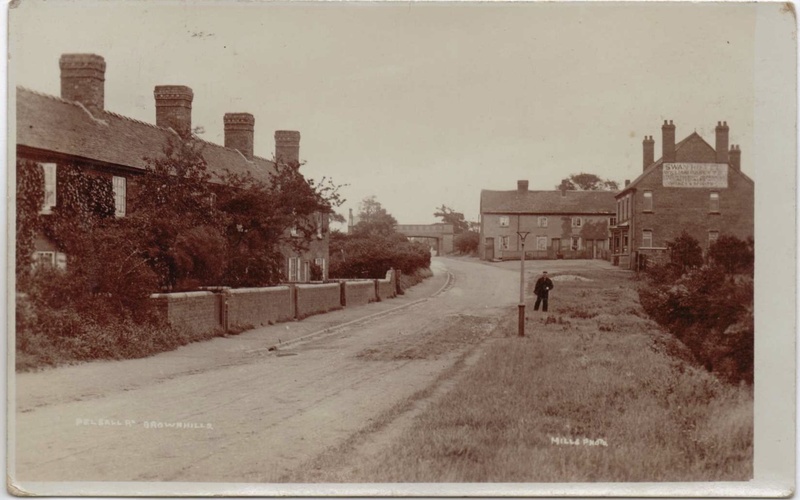 The Ogley Schools – left and right, with the police station on the left, looking down Church Road to the High Street. Image courtesy of Ruth Penrhyn-Lowe. 32 Responses to Wish you were here? Quick bit of detective work. 1901 census Ethel M (“corrected” to May) Gibbs, 8, b. Swindon, Wilts, with uncle, at Earley, Berks. But was this the addressee? 1911 census, Gibbs at 31 Ripley Rd, Swindon. No miss, but Francis Edward, 15 years. 1901 census, same family at 13 Eastcott Rd, Swindon, with Elizabeth A Gibbs, unmarried, 18 yrs. 1911 census, Elizabeth Annie Moulder, 28, right birthplace, fits marriage 1904 Henry Moulder, at 3 Little Clarence St, St. Giles, Oxford. Crucially, also sister May Gibbs, 18, b. Swindon, shop assistant. 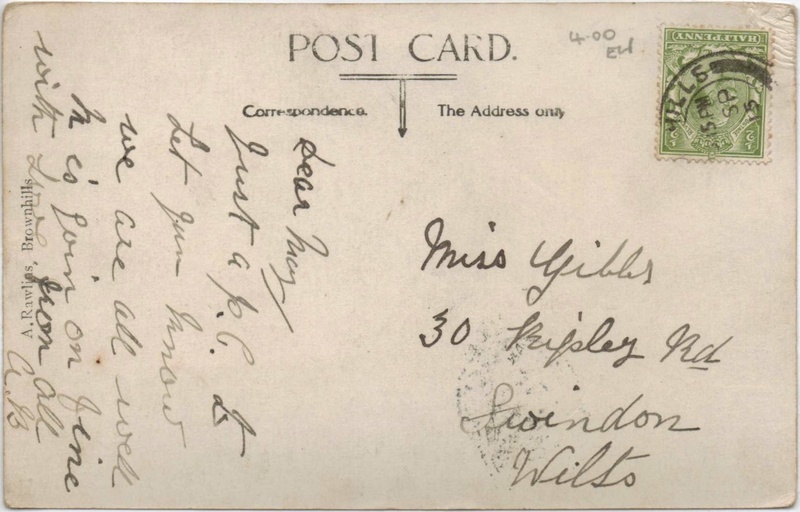 So, the addressee was Miss Ethel May Gibbs, who it appeared had returned to Swindon by 1915, when the card was posted. A pity the sender didn’t give more than initials. What a fascinating insight into local history. As an Aldridge girl, would love to see the old photos of Aldridge too, but nonetheless, just love what folk get in touch with you about Bob, it really is wonderful, my thanks to all your contributors I really love it all. The closest I can get to Mr B Locke is Wilfrid (aka Bill?) John Locke, 1911 census, 11, railway porter GWR, born Lower Slaughter, at Lower Slaughter with sister and widowed mother. Same family and place, including father John, 1901. There is a tree on Ancestry, but no one with intial B or name such as William (Bill) or Robert (Bob) alice in 1907. Again there is too little information about the sender to attempt identification. Looking at the “crossroads” picture. Some of the buildings are still there, albeit altered. We tend not to think of this as a crossroads these days, but, presumably, it’s where Hednesford Road reaches the Watling Street and the path continues to Chester Road. The man walking towards the camera appears to be carrying a bucket and shovel; after horse manure perhaps? The Brownhills Pubs web page (http://members.madasafish.com/~d_hodgkinson/bh-pub.htm) says there has been a Swan pub since 1834, and my spreadsheet of landlords says the Swan was run by and Edward Beck (White’s Directory). In the 1841 census Edward Beck is listed as a farmer. This was his primary occupation and is an example of why it can be so difficult to trace publicans when their main job was farmer, miner or some other occupation. But because he was not the publican in 1851 (Stephen Cooper, same source) it cannot be concluded that he ran the pub in 1841. Thank you for the postcards Ruth there lovely. thank you for the super images, Ruth. The Watling Street image is very interesting. I wonder what lay behind the railings…and if the coal was a miner’s allowance…was it five cwt per month? Could the railings have been to do with the bridge over the Midland Railway? Was this the Shant Bridge? 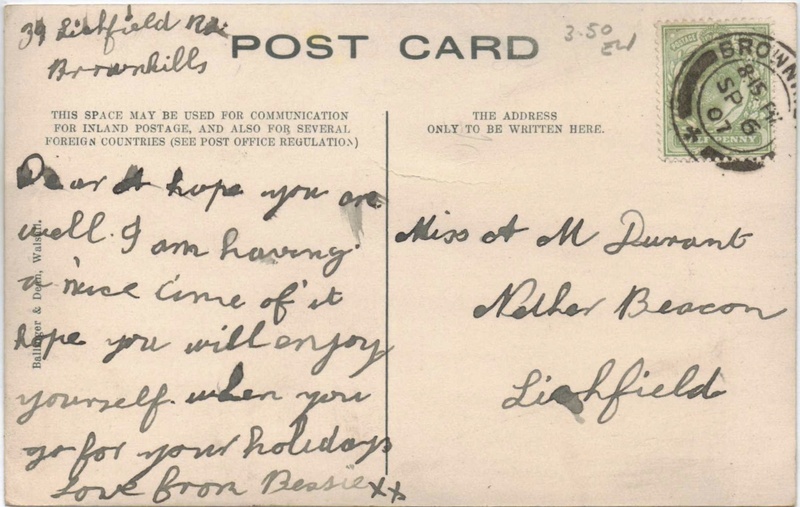 Are you related to William Jones who married Hilda Holland in 1925 at Lichfield? Andy I would say you are correct, the photo would have been taken Rising Sun side of the bridge that took the Watling St over what was the Mineral Railway taking coal trains from Lady Colliery at Heath Hayes, Coppice Colliery at Norton Canes and Colliery at Chase Town (can’t think of name) to link with main line Pelsall side of Brownhills. The line ran from Heath Hayes down through Norton Canes to Coppice Sidings, then crossed Brownhills Rd, Norton East Rd, along side Swag and was then joined by the line from Chase Town crossing between Swag and Norton Pool. The line then continued along side Norton Pool to where Chasewater Preservation Railway is then parallel with Hednesford Rd under Watling St, over Chester Rd then crossing Pelsall Rd at Brownhills and linking with the Main Line Lichfield to Walsall. Superb find and very generous of Ruth. I see you featured the Pelsall Road/Swan photo back in 2011, Bob, as seen in ‘Memories of Old Brownhills’ by Clarice Mayo & Geoff Harrington. However, that book’s caption suggests the 1920s as a date for the photo, though now thanks to Ruth we know it must be 1907 or earlier. To Ruth and Bob – many thanks for these photo’s. I’m especially interested in the Pelsall Road/Swan PH, as my dad’s family lived in the row of houses running from the main road back behind the Swan. He said that the ‘gardens’ backed onto the railway line which can be seen in the distance. I have never seen a photo of where he lived. Unfortunately he died in 2009, aged 93, and he would have loved seeing these photo’s. My dad was Ernest Douglas, better known as Doug. He had three brothers – Jim, Harold and Reg + three sisters Floss(Florence), Pat (Martha Jane) and Evelyn. His dad was James married to Florence (nee Stokes). I think that they had 15 children – one of which I think was a William. So your Grandad was Mavis’s uncle Jim then. She says that Reg emigrated to Canada. Mavis’s father in law William was cousin to your Grandad Jim. As you say Reg emigrated to Canada where he died several years ago. Dad was in fact the last of the brothers and sisters. Grandads brothers & sisters included a Clara, Nancy, Danny, Lester, Polly(Beatrice- who we used to visit in Worksop Vale, Notts many years ago),Rose and Florence. I believe there are others! Mavis says Polly ( real name Mary) was her grandmother. Danny lived on Pelsall Rd I think it was 183, next to Jims your grandad’s No 181. these were opposite the Jolly Collier pub. I stand corrected – dads list had Polly as a Beatrice, and after checking again wrong Polly/wrong branch of the family tree. You are also correct in that Dads uncle Danny did live next to grandads in Pelsall Road, opposite the Jolly Collier. Grandad lived there with my uncle Harold and Auntie Anne. So sorry you are related. Hi Terry this is Mavis Harrison (Nee Cooper) I used to visit your granddad when I was young and its possible we met up at that time as sometimes your Dad was there with family too I am living at Walsall wood now but used to live in Clifton Avenue which was behind your Granddads house, its good to pass on info . Danny Harrison used to drink in the Jolly Collier every Sunday lunchtime during the 1970’s, he was chauffered by his grandson, whose name I’m struggling to remember? 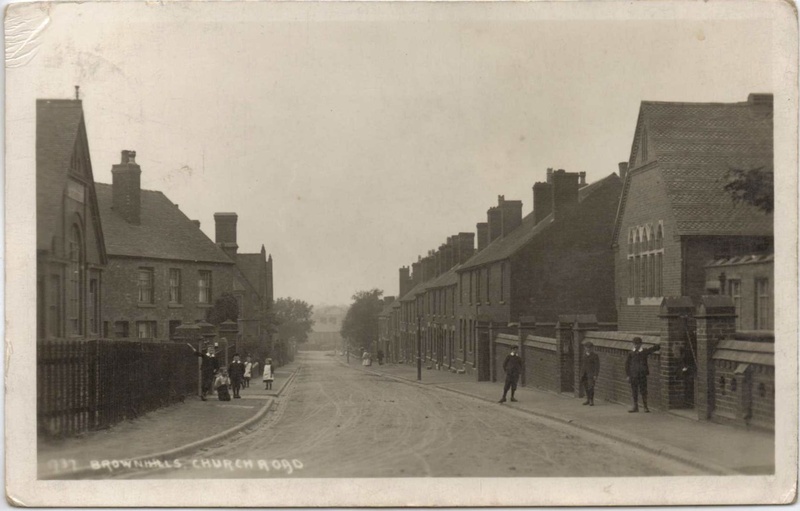 I am trying to locate a picture of a Charles E Harrison who lived at Woodbine Terrace Brownhills . I believe hime to be my mothers father.Mum was born in Oxford in 1930 and she was told that Charles was her father and was given the address above that she wrote to when she was about 15. She received a letter back from a Clarice that Charles was in Germany at that time as a dispatch rider. Mum is now in her 80’s and would love to put a face to his name.He did return to Oxford when he was on leave but she does not recall seeing him. Thank you if you are able to give me any help with this. Nether Beacon is a small side street running to the right off Beacon Street, Lichfield, when heading north out of he city. the date of the Watling Street photo intrigues me. When was it published? Well, in the distance we can see Rehoboth Methodist Church, built 1892, opened 2nd of October of that year. The enlarged vestry is visible..built in 1907, and we can see the ex-army hut, post- world war one, “from the army camp at Brocton”. (.all taken from the chapels Diamond Jubilee celebration booklet, 1952) .But thats as far as I can go ….. Unfortunately the text does not give a date for the purchase of that hut. Perhaps the three posts, and the gas street light, in the left foreground might help. Is the tall post actually an iron sewer vent? 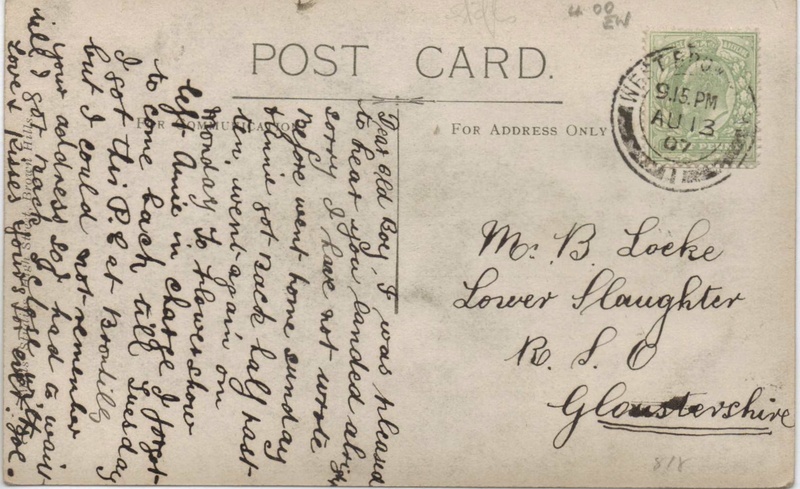 I wonder if a date for this wonderful postcard can be worked out? Can readers please help? I have an image of Oliver Birch’s son, Arthur, outside the family shop in High Street, Brownhills, probably about the start of WWII. Its not a brilliant image being a photocopy of a small original but if someone would like a copy they only need to ask. 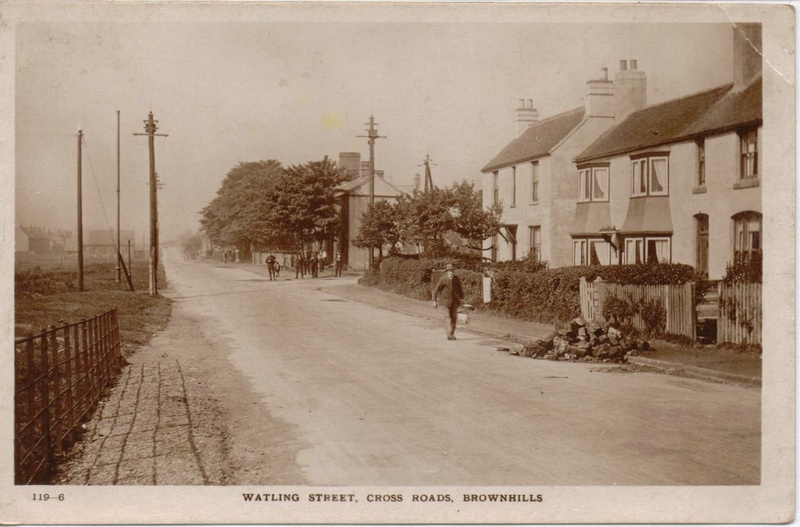 While here if anyone has any information on the cross family who on the census were shoemaker in brownhills/Ogley hay according to census records, I’d be grateful.